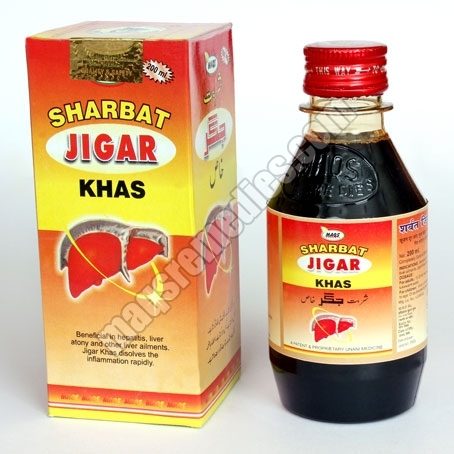 This Marvellous Drug is Manufactured Under the Super Vision of Unani Pathy’s Experts with the Herbs of High Quality & Fresh Herbs Which are Being in Practice Since Several Decades, Sharbat Jigar Khas Highly Effective in Hepatitis, Chronic Hepatitis, Chronic Constipation and Gastritis. it Enhances Appetite. Its Prolong Use Increases Red Blood Cells in Blood, There By It Makes Active & Life with Zeal. It Excrete Out Waste & Toxic Substances Through Urine and Faeces There By Results Healthy Kidney, Liver & Urinary Blader. Dosage : 10-20 ML Twice a Day or as Directed By the Physician.